This past week I was in Michigan and went to the Henry Ford Museum and Village in Dearborn, The displays and collections at each place were quite amazing. 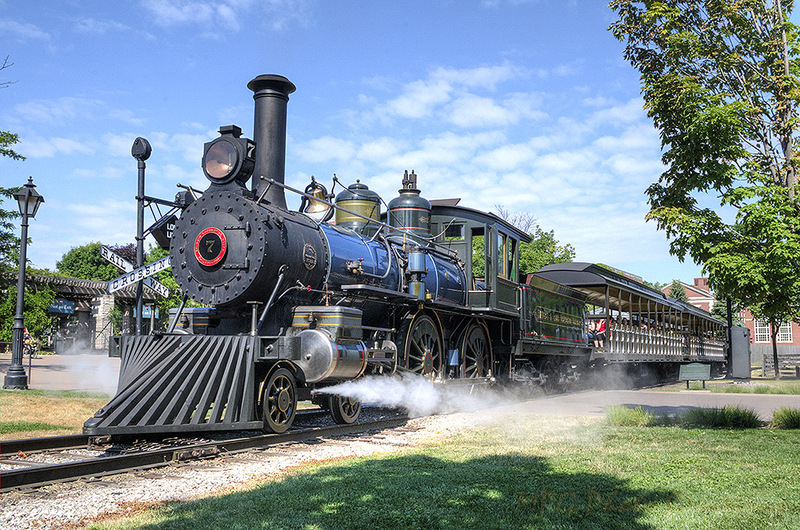 The Greenfield village has a steam train that runs around it all day. They rotate through 3 locomotives to pull the train, 1 each week. This particular one is #7 from 1897 and was Henry Ford's locomotive that pulled his Pullman car whenever he needed to travel somewhere. It is a beautifully restored locomotive and I loved the color of it. I rode behind it several times and also photographed it in various spots throughout the Village. Here it is pulling out at the main entrance.